Traditional American buttercream icing contains powdered sugar, shortening, butter, milk or cream and vanilla extract. The proportion of the ingredients varies according to the recipe you have chosen. If you select high-quality ingredients, you are more likely to achieve a superior icing with a silky texture. If you fail to take the time to sift the sugar or to fully cream the sugar and butter before you incorporate the next ingredients, the icing may turn out gritty. 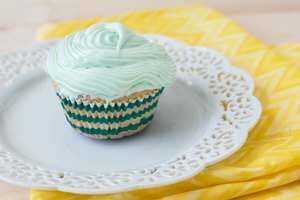 Follow several techniques to ensure your buttercream icing reaches the desired creamy consistency. Allow all your ingredients to come to room temperature. Ingredients that are at room temperature will incorporate together more easily. Inspect the powdered sugar. If any lumps remain, sift the sugar again to ensure it is a very fine powdered consistency. Add the butter and cream to the bowl. Cream the shortening and the butter in the mixer for at least five minutes on a medium low setting. Scrape the sides of the bowl. Continue to cream the mixture for three to five minutes or until the mixture is light and creamy. Add the vanilla. Turn the mixer on low for about one minute. Regular vanilla extract can be substituted for clear vanilla extract if necessary. The clear version allows you to achieve a pure white color. If you are going to color the icing with icing gels, using the regular vanilla will not make a difference. Add the sugar gradually, about half a cup at a time. Beat at a medium speed until the sugar is fully incorporated. Scrape the sides of the bowl before adding next portion of sugar. Add another half cup sugar and beat until fully incorporated. Repeat this process until all 4 cups of the powdered sugar are fully blended with the butter. Slow incorporation of the sugar helps avoid the icing from having a gritty texture. Add the milk or cream. Beat at medium speed until the mixture reaches a light and fluffy consistency. Test the consistency of the mixture. If the mixture is not creamy enough, beat the mixture for five more minutes. The icing is finished if you are using it to apply decorations, writing or pipe borders or flowers. Add 2 tbsp. of light corn syrup if you are going to use the icing to spread frosting on the cake. Beat for two to three minutes to ensure the corn syrup is fully blended. Cover the icing with a damp towel until you are ready to use. This Wilton Buttercream Icing recipe yields 3 cups icing. You can store unused icing in an airtight container in the refrigerator for up to two weeks. Alyson Akers has worked in print journalism since 1993. During her years at the "Hattiesburg American," the "Vicksburg Post" and the "Arkansas Democrat-Gazette," she worked as an editor, writer and page designer. Akers earned her degrees in journalism and English at Auburn University.